Among the strategies for driving high quality traffic to your Shopify store, a Friends of Fans ad campaign on Facebook is definitely on the list of campaigns that you should be running. Not only are these campaigns highly effective, but Facebook also makes them super easy to implement! As the name suggests, this strategy targets the friends of people who have liked your Facebook page. Say that you have 100 fans on Facebook who each have 200 friends, your target audience of new prospects would be 20,000people. 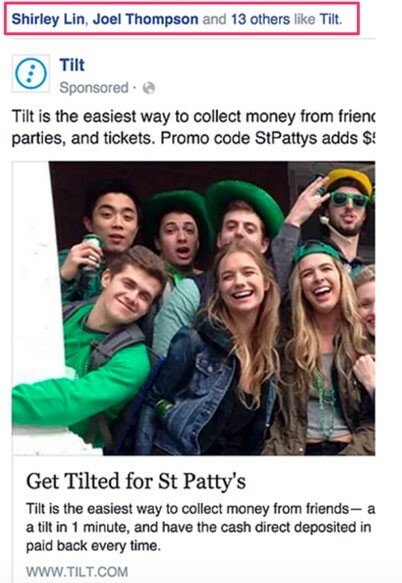 What makes this so powerful is that your prospects will see a short text above the ad indicating which of their friends have already liked your brand. This social proof acts as an endorsement of your brand from friends that your prospects already trust. Additionally, the likelihood that your fans’ friends are within your target demographic is extremely high. After all, people are generally friends on Facebook with others who are like-minded! Now that you know why a Friends of Fans campaign is so effective, you’re ready to dive in! Start by choosing a campaign objective like you normally would. Send people to your website or Increase conversions on your website are good options to choose here. This is where you’re actually going to target the friends of people who like your page. Under “Connections”, select Facebook Pages > Friends of people who like your Page. Optional — feel free to experiment with narrowing down this audience even further using additional detailed targeting (age, gender, etc) in this section. Then, select your Facebook page from the list. Remember to specify the countries you want to target here. It’s that simple! Now you’ve got an audience of prospects who are friends with people who like your Facebook page. Finally, set your daily budget and create your ads. Go ahead and experiment with different ads here. As shown in the example earlier, Facebook will automatically highlight the names of the prospect’s friends who like your page, directly above the ads you create. Go to Facebook to Create this Ad. People who are browsing Facebook are not sitting with a credit card in hand, ready to make a purchase the moment they come across your store. Next step: Retarget your prospects. In order to convert those new Friends of Fans prospects into customers, we highly recommend running a retargeting campaign along-side your newly created Friends of Fans campaign. At Shoelace, we are obviously huge fans of retargeting using the Facebook Pixel. This is where the power of retargeting can really shine. These high quality prospects can quickly forget about your brand moments after they’ve left your site for the first time. Retargeting helps you get in front of those visitors again, several times over the next couple of weeks to encourage them to come back and make a purchase. Here is a great post from Shopify on how to get started with Custom Audiences. Or you can add the Shoelace app to your store and let us automate your retargeting! We’d love to hear from you. If you’ve tried running this campaign, tell us about your experience in the comments below. Shoelace is an intelligent assistant that automates your retargeting ads on Facebook. Check us out on the Shopify App Store.